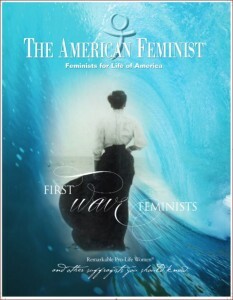 "First Wave Feminists: Remarkable Pro-life Women® and Other Suffragists You Should Know." What’s your choice? Do you keep our rich pro-life feminist history to yourself or do you share it with others? Feminists for Life has released the issue of The American Feminist® entitled “First Wave Feminists: Remarkable Pro-life Women® and Other Suffragists You Should Know.” This issue includes biographies of every significant pro-life feminist from the first wave. It includes the most powerful quotes you will ever read as we bring these women to life! Your spirit will soar as you feel yourself in communion with those who lived a hundred and fifty years ago and believed as we do today. This is the time when you decide how important is the future of Feminist for Life as it relates to our role to help transform this world. This is the time when you decide if you will share this issue with your family and friends by giving them a gift membership for $35 (or $25 for students). This is the time to let us know of any address changes so we make sure you receive your copy of this next great magazine. So get ready to dive into this timeless issue entitled “First Wave Feminists.” These early suffragists believed in the worth of every human being. They spoke eloquently about the unmet needs of women and the plight of born and unborn children. It is important for us as their heirs to share this legacy. Join or renew now, and share the facts with family and friends. I am grateful to the visionaries like you who sacrifice to make life better for women and children at highest risk of abortion. Feminists for Life of America is a 501(c)3 nonprofit. Membership contributions and donations are tax-deductible to the extent allowed by law.